To you, the seasoned performer, a gig might just be another night to exercise your chops, play for friends and fans, and test the waters on a new song. For audience members, it's often an event, something they've anticipated for weeks. Make your show that much more special by letting them see the night through your eyes. Believe it or not, many people have never set foot on a stage and have no idea what it's like to look out over a room and into hundreds of eyes peering back at you. This is their big chance to understand, at least vicariously, how you feel when you perform. Plus, as a bonus, your fans might spot themselves, which is not only an added thrill, but also a screen-cappable and shareable moment sure to delight anyone in the crowd. Because of the convenient, hands-free operation of Spectacles, the world is your oyster when it comes to postable possibilities. Give your fans an inside look at your non-musical side though all of the other activities that occupy your time. Are you really into mountain biking? Snap along on your favorite trail and give your followers a glimpse into your "happy place." If you're a foodie and take your cooking seriously, this is a perfect opportunity to give them a front-row seat to watch you perfect a recipe. If you're a visual artist, let them experience the birth of your latest creation. If people love your music, they're also probably dying to get to know the person behind the guitar (or keyboard, or drums, or mic). Spectacles make it that much easier. If you're a Snapchat user, it's a safe bet you've snapped rehearsals before. But rarely do you get the good stuff. Why? Because your hands are busy doing, well, musical things. Before now, it was impossible to snap that killer guitar solo you're so proud of. But with Spectacles, you have the freedom to showcase your mad skillz for the world and still let your hands do their job. Take a walk around the room and make your bandmates uncomfortable by getting up close and personal with their flying fingers without interrupting the song. Give your followers an opportunity to see your rehearsal process from your eyes. If you're working off of a lyric sheet or chord chart, they'll love learning your latest song from watching your snaps. If you're a gearhead, or even a gearhead-in-training, you're probably pretty particular about your equipment. It's likely that even the most non-technical fan wouldn't hate taking a closer look at your favorite vintage amp or prized bass. If it's important to you, it's important to them. A note of caution: be careful not to get too technical. This is Snapchat, after all. ILoveMyPedals67 from your favorite message board probably isn't watching. Your followers probably won't be impressed hearing about your mods. Instead, use this time to show off your passion for your instruments and gear while slipping in a tiny, little lesson for those of us who don't know a humbucker from a hamburger. Just like many of your fans have probably never been onstage, they've also probably never attempted to write a song. Even if they have, every songwriter's process is different. Because songwriting is often an intimate process, or one that involves one or more cowriters, few fans rarely get to see inside this world. Thankfully, Spectacles make bringing in outsiders non-invasive. Just make sure everyone in the room is comfortable going public with your songwriting session. Make this interactive by inviting your followers to snap you back with lyrics inspired by the melody you're pounding out on the piano or with song titles. You could even hold a mini-contest basing a whole song around one lucky follower's concept. What sets you apart as an artist? Your immediate reaction might be your snazzy collection of jackets, your introspective lyrics, or your ability to pound the sh*t out of your drums. But, let's be real, you want fans to think you're hip, inventive, and up to date as well. As social media evolves, it's easy for musicians to fall behind. You're busy making music, and marketing is often an afterthought. Even though Snapchat's been around for awhile now, it's still considered a hot, young platform, and many musicians haven't even bothered with it. 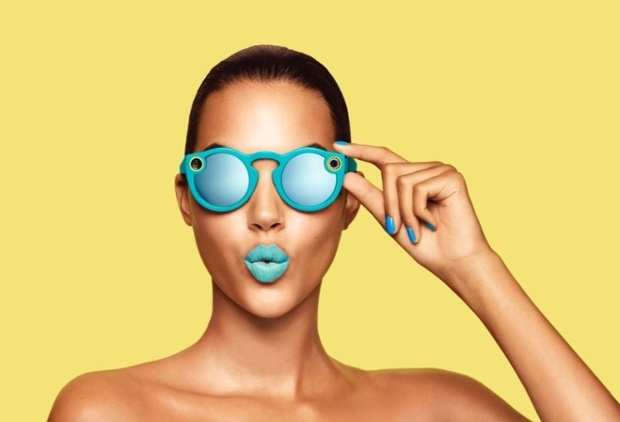 Spectacles can be your entry into this techy world. Because of their recent scarcity, and the fact that a lot of people probably don't realize they're on sale en masse yet, your technological cred will take a huge jump forward. And yes, you'll look really cool, too.